It was the kind of celebrity-filled sellout crowd you could only find in Los Angeles, and the electric atmosphere lent itself to an evening filled with drama and storylines the likes of which are usually reserved for the movie studios across town in Hollywood. These are the UFC 227 talking points. TJ Dillashaw punches Cody Garbrandt in their UFC bantamweight championship fight during the UFC 227 event inside Staples Center on August 4, 2018 in Los Angeles, California. (Photo by Jeff Bottari/Zuffa LLC)" />That’s a wrap! 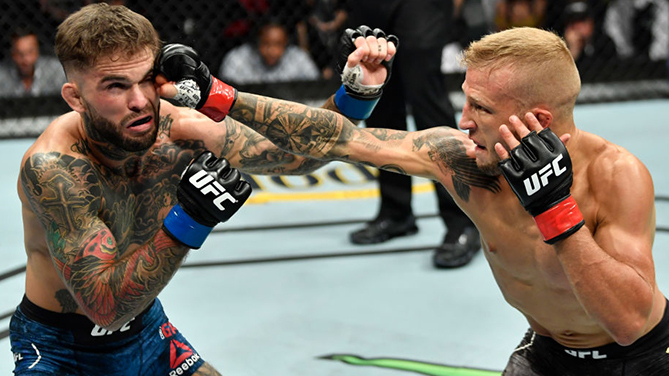 The bad blood between TJ Dillashaw and Cody Garbrandt is over – for now. The reigning bantamweight champion put an exclamation point on the rivalry after defeating ‘No Love’ by first round TKO at UFC 227 in Los Angeles. So now that the dust has settled, what’s next for Dillashaw? Immediately after his incredible flyweight title victory over Demetrious Johnson, new flyweight king Henry Cejudo called for a fight with the bantamweight champ. And after he beat Garbrandt, Dillashaw said that he would be open to the bout. While the fight is a possibility, there are likely other suitors in the bantamweight division that could make more since for Dillashaw. A rematch will former champion Domick Cruz makes sense if Cruz is healthy, also a showdown with the rising Marlon Moraes would be one heck of a fight. But don’t count out the streaking Raphael Assuncao earning a rubber match with Dillashaw. Even though Assuncao lost to Dillashaw at UFC 200, he did beat Dillashaw back in 2013 and Assuncao has won 11 of his last 12 fights. Stringing together victories over the aforementioned Moraes, as well as Rob Font, Matthew Lopez, Pedro Munhoz and Aljamain Sterling. No matter who Dillashaw faces in the Octagon next, he is certainly excited to start building his legacy outside of the Garbrandt rivalry. It’s been a long road to the top, but Henry Cejudo is officially the UFC flyweight champion of the world. Two years after being knocked out in the first round by Demetrious Johnson the UFC has only its second division champion. To put it in perspective for you, the UFC 227 split decision victory loss was DJ’s first since 2011 and ended a 13-fight win streak. What a moment for the 31-year old Cejudo, who was born just ten minutes from STAPLES Center in downtown Los Angeles. This is uncharted territory for the flyweight division and Cejudo has a chance to write a legacy as dominant as Johnson’s. One trait in particular that had everyone in the arena talking was Cejudo’s composure, both in the Octagon and outside of it. He truly carried himself as a champion all week leading up to the fight and turned his mentality into reality. Very impressive. It will interesting to see if Cejudo vs Johnson 3 is what’s best for the new champion. But before Cejudo starts thinking about what’s next he will sit back and enjoy the newest collection to his trophy case. Pedro Munhoz emphatically bounced back from an uncharacteristic loss with a decisive decision outing against Brett Johns. Johns didn’t make it easy, marching forward with a Terminator-like refusal to die, but Munhoz’s three knockdowns set a UFC single-fight bantamweight record in this Fight of the Night candidate.